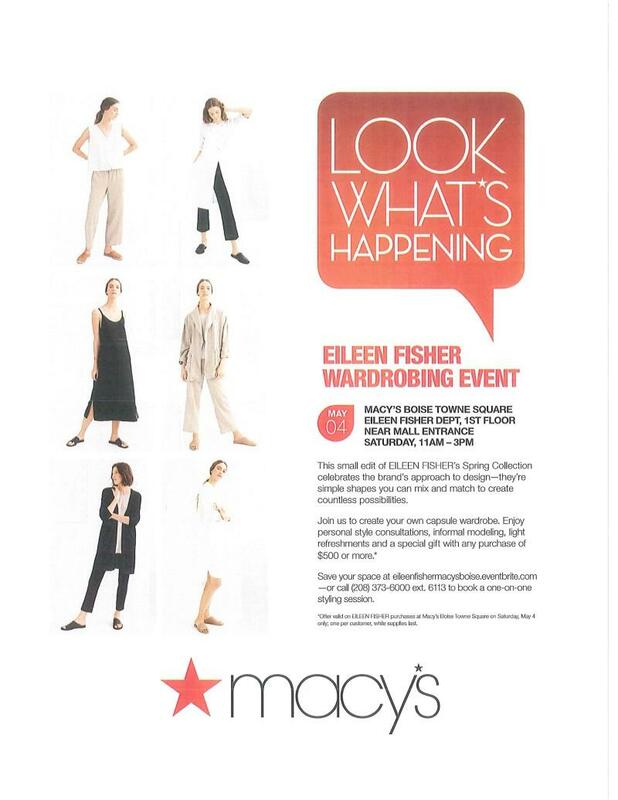 Macy's Boise Towne Square EILEEN FISHER'S Dept, 1st floor Near Mall Entrance Satirday, 11AM-3PM. This small edit of EILEEN FISHER'S Spring collection Celebrates the brand's approach to design-They're simple shapes you can mix and match to create countless possibilities. Join us to create your own capsule wardrobe. Enjoy personal style consultations, informal modeling, light refreshments and a special gift with any purchase of $500.00 or more. Save your space at eileenfishermacysboise.eventbrite.com or call (208) 373-6000 ext 6113 to book a one-on-one styling session.